The transcendentalist movement of the 1830s developed in New England as a reaction against the mechanical materialism and rationalism of much eighteenth century philosophy. Most of the inspiration for this movement came from Unitarian ministers, who believed that the spirit had gone out of the churches and that religion needed a new vision. 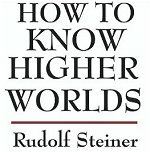 The proponents claimed that the invisible spirit is the true reality, and held that each person is an extension of a universal spirit, or “over-soul," that speaks through them in a unique and creative way. They defended the right of each individual to follow the dictates of his or her own conscience instead of established religious authority. Charles Fourier (1772-1837) saw manual labor as degrading and irksome, whether in the factory or the field. He believed that all work could be turned into play—made desirable and satisfying, physically and mentally. He designed a self-contained community, housing 1,620 members, called a phalanx after the Greek term for a unit of tightly linked fighting men. He believed men had twelve fundamental passions--the five senses, four of the soul (friendship, love, ambition and parenthood) and three related to work (love of variety, rivalry, and conspiracy). People were to be organized in squads according to “passionate attraction" thus ensuring their happiness at work. Albert Brisbane (1809-1890), a wealthy student from upstate New York, became Fourier's disciple in 1832 and returned to the United States from France hoping to start the first American Fourierist community. He began Association, the communitarian socialist movement, gaining publicity and supporters among the social reformers of the country. Brisbane stressed the compatibility of the phalanx plan with American ideals of self-government, personal freedom, equity, and social progress. The first American phalanx, the Social Reform Unity, was founded in 1842 in Pennsylvania, and two years later Brook Farm in Massachusetts, discovering the teachings of Fourier, converted to Fourierism. Before the Civil War, 28 phalanxes were founded in the United States, and the movement encompassed dozens of Fourierist clubs in cities across the country as well. Cooperative socialism proved versatile and attractive even to those unprepared to commit to the absolute communalism of phalanx living. The utopian socialism of Charles Fourier spread throughout Europe in the mid-nineteenth century, but it was in the United States that it generated the most intense excitement. The artist attacks abolitionist, Free Soil, and other sectionalist interests of 1850 as dangers to the Union. He singles out for indictment radical abolitionist William Lloyd Garrison, Pennsylvania Free Soil advocate David Wilmot, New York journalist Horace Greeley, and Southern states' rights spokesman Senator John C. Calhoun. 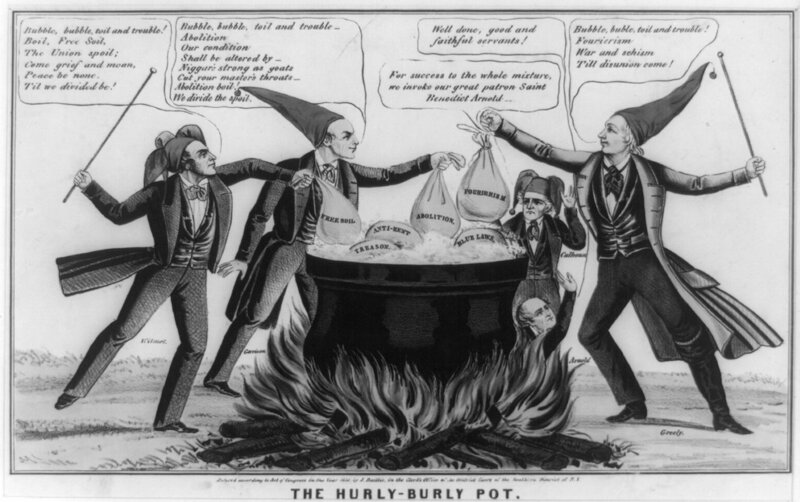 The three wear fool's caps and gather, like the witches in Shakespeare's "Macbeth," round a large, boiling cauldron, adding to it sacks marked "Free Soil," "Abolition," and "Fourierism" (added by Greeley, a vocal exponent of the doctrines of utopian socialist Charles Fourier). Sacks of "Treason," "Anti-Rent," and "Blue Laws" already simmer in the pot. Wilmot: "Bubble, bubble, toil and trouble! / Boil, Free Soil, / Ther Union spoil; / Come grief and moan, / Peace be none. / Til we divided be!" Garrison: "Bubble, bubble, toil and trouble / Abolition / Our condition / Shall be altered by / Ni~~ars strong as goats / Cut your master's throats / Abolition boil! / We divide the spoil." Greeley: "Bubble, buble [sic], toil and trouble! / Fourierism / War and schism / Till disunion come!" In the background, stands the aging John Calhoun. He announces, "For success to the whole mixture, we invoke our great patron Saint Benedict Arnold." The latter rises from the fire under the pot, commending them, "Well done, good and faithful servants!" Van Buren's flight from various foes, each depicted as an animal. 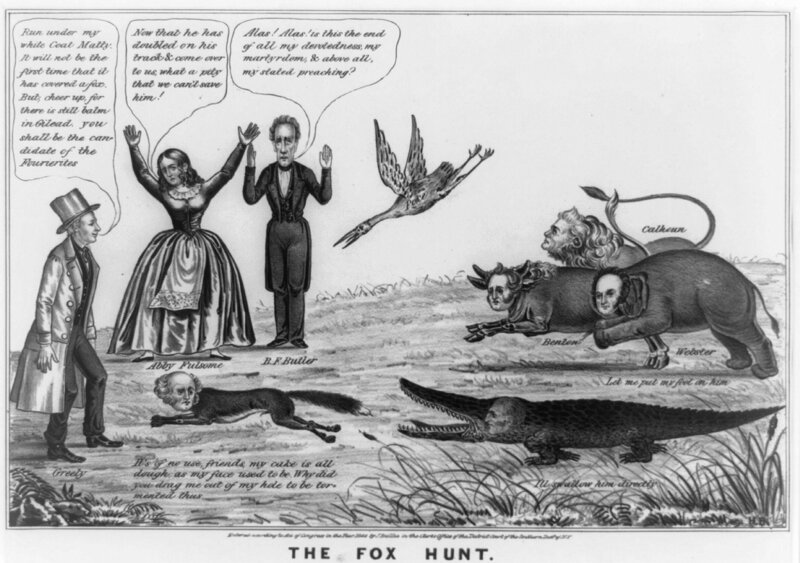 In pursuit of Van Buren are Zachary Taylor (as an alligator), and senators Thomas Hart Benton (a bull), John C. Calhoun (a lion), and Daniel Webster (an elephant). Taylor vows, "I'll swallow him directly," while Webster says, "Let me put my foot on him." A crane "Poke," actually incumbent Democratic President James K. Polk, swoops toward the fleeing fox from the sky. On the left stand editor Horace Greeley, Folsom, and longtime Van Buren ally Benjamin F. Butler. Greeley tells the fox to "Run under my white coat Matty. It will not be the first time that it has covered a fox. But, cheer up, for there is still balm in Gilead. You shall be the candidate of the Fourierites [i.e., members of the reform movement championed by Greeley]." Folsom laments, "Now that he has doubled on his track & come over to us, what a pity that we can't save him!" Butler exclaims, "Alas! Alas! is this the end of my devotedness, my martyrdom, & above all, my state preaching?" Van Buren replies, "It's no use friends, my cake is all dough, as my face used to be. Why did you drag me out of my hole to be tormented thus." "Doughface" was a name given northern friends of slave interests, which Van Buren was perceived to have been during his administration.